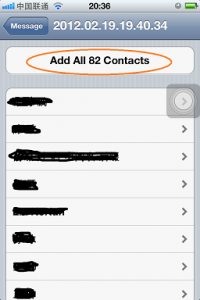 Backup your contacts,UTF8 encoding vcard, avoid garbled when import contacts to other phone or PC. Best choose of non english user. TTvCard backup all contacts in a single vcard file, and send it by mail. But TTvCard will not recover contacts from vcard. 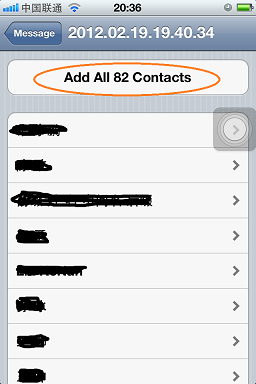 Instead, system email program will help us to recover contacts. 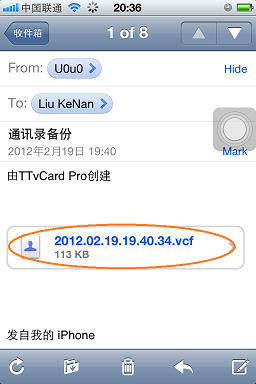 Open Mail program, found the mail send by TTvCard. 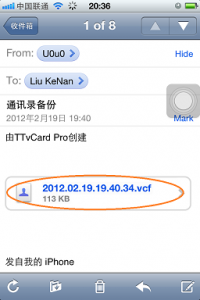 Tap the attachment of vcard file. Save the .vcf file to disk. If you like this app, try to get TTvCard Pro. I used this per instructions and it made updates of existing files on my Mac Address book, but it did not add new contacts from my iPod Contacts to my Mac Address Book which is what I want to do. I am disappointed. This instructions is about how to recover on iOS device, not for mac. I have update this instructions, add "how to import on Mac".